I don’t know about you, but the thought of food right now makes me even more full than I already feel. WAY too much indulging this week! Still, there’s more…New Year’s is right around the corner, and good eats are a must for that holiday, too. I’m sure you know what these little goodies are. Great tasting and one of the easiest snacks you can make. Always a huge crowd pleaser! It’s amazing how something so simple can be so well received. Preheat oven to 375 degrees. Open crescent rolls and lay dough out. 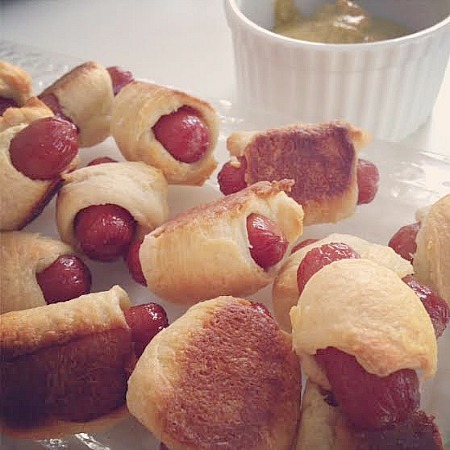 Cut each piece in about half (there’s no science to this…just cut into pieces big enough to wrap around each hot dog). Pat dogs with paper towel if wet from package liquid. Wrap each in dough, all the way around, and place on tin foil lined baking sheets. Bake for around 12 minutes. Remove from baking sheets and serve warm with mustard for dipping. This entry was posted in appetizers, pork, QuickAndEasy, snacks. Bookmark the permalink.